Surviving A Nearly Fatal 'Accident' Or Was This A Hit Job Using A Directed Energy Weapon? Bo Atkinson's Blog page .. .Bo's pictorial index spanning over 2 decades. I have researched the particulars for years and then meditated upon the circumstances around my 2007 traumatic injuries. I conclude that i had been attacked. A second attack of this August 2013 has prompted me to more closely review and update this page and add a new, linked page as well. My website includes two long-winded warnings to highly aware persons- To regularly sharpen their awarenesses and their senses. In that a pattern of attacks appears to be unfolding. (First Incident ~~~ Second Incident). I was experimented upon and affirm that one can survive these attacks, given due diligence. I believe that among the best defences is a strong sense of personal integrity. Which should sit on one's shoulder and weed out the impulses which very well could be a hidden electronic attack, upon one's senses or upon one's neural motor skills. Such unexpected, external impulses could potentially afflict the conscientious person, who may well become today's targeted individual. It is my long studied opinion, that humanity is under attack. That a hierarchy of perpetrators aim to alter the course of human destiny. That a form of genocide is in progress to achieve this end. That the intended outcome is to be a very servile remnant of humanity- While a majority of humans in general would subsequently be removed from this planet. On the surface, this 2007 occurrence might appear like two careless accidents, which humans suffer, in the labor of earth-moving. After years of reflection on the circumstances: I conclude that forces beyond the range of common human perception, were the cause of my nearly fatal injury described below. Previously i had simply blamed myself, for lack of better evidence. Also my intent was to protect the reputation of my friend who operated his excavator at the time of my injury. While digging deeper in this construction site: I sadly managed to get hit in the head by the 20+ ton excavator, (later in the day, as my friend dug the well). I had to save the honor of my friend as it seemed like my own fault for exposing myself. I have concluded that my awareness was suppressed, by forces outside of my own control. I simply was not expecting such forces of suppression existed in this world. I have concluded, after much research into psychic phenomena and into electronics-tech, that it is indeed possible that human-senses can be interfered with and also manipulated. I had ignored such possibilities earlier, for lack of such expectations. Essentially i believe my senses and motor control were overridden. I have considered testimony of two family witnesses, in addition to my friends testimony-- Just before the accident, my friend had the understanding that i was not present, that i had departed from work for that day. My traumatic injury occurred in the excavator's blind spot. (Excavator arms always present this blind spot, naturally). In fact i was leaving the vicinity, some moments before my traumatic injury. What ensued, in my recollection, was "missing time just minutes before the traumatic impact. Yes, my human-awareness had stopped before i was hit (and i was nearly killed). 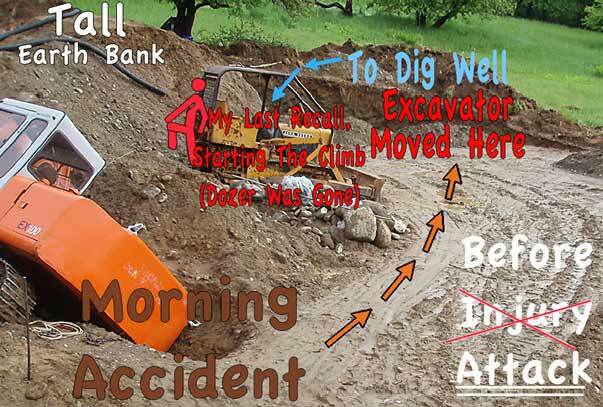 Also, two witnesses, (my sister and the excavator operator), shortly after the traumatic injury had occurred, say that they saw me precariously walking towards a likely fall into the deep ditch. They say they got there just in time. My friend the operator (Steve Palmer), heroically jumped across the deep ditch to lead me away. They took me to a house, while i walked with difficulty and somewhat incoherently. I have absolutely no recollection of these post-traumatic efforts or moments. Except for their testimony, shared soon after the "traumatic injury". My expectation is that my precarious walking was in fact an attempt by electronic perpetrators, to finish killing me. A remotely operated, directed energy weapon was being experimented with, by the perpetrators. I was selected as a target, in part due to my long history of attempting to raise my consciousness. I happened to fit a profile of awareness which likely resist such attacks. So that their goal would be to assure that the electronic weapon was capable of overriding strong minded persons. The perpetrators, it seems to me, are in the process of improving weapon systems, to single out careful-thinkers and to murder targets of interest to themselves. Targets where only one shot will be available to them. In case the targets develop higher awarenesses to foil this sort of attack. More on the evidence of mechanical aspects follows: Next is a picture taken some days before the traumatic injury. Followed by an account of "the tread derailment", occurring before the traumatic injury. In the tread derailment, my friend had straddled the deep ditch to distribute a little gravel at the ditch bottom. 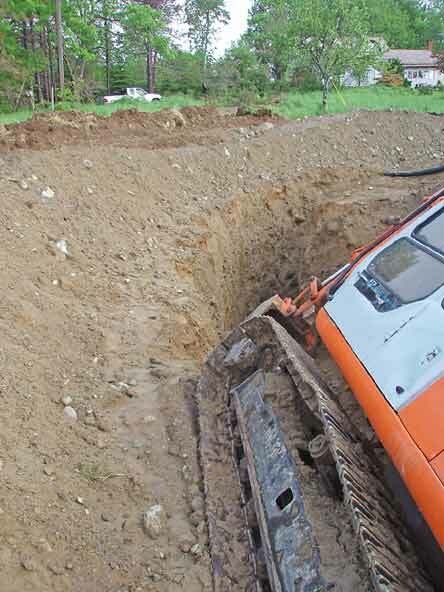 He did this somewhat boldly with his excavator. 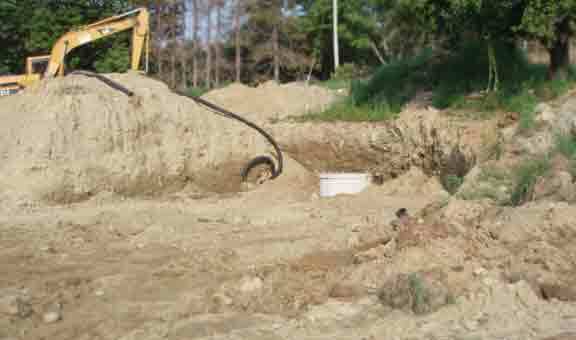 His straddling resulted in a cave-in of the ditch,(photo below), but no person was physically injured in this incident. I helped him along with a local a logger on his tractor-or-skidder. With the pictured, yellow bull-dozer side-leveraging the excavator with it's arm raised, i tilted the excavator pulling with a chain, onto the good track. (This worked out beautifully). We managed to get the machine out of the caved in ditch. My friend's excavator had derailed it's right-hand track in the ditch. So he had to back out, on the left hand track only. Hence the added need for raised-arm-leveraging, of the heavy machine to it's left-hand side. Later, we had to pry the derailed (right-hand) tread back onto it's rollers as the cave-in had derailed it. Later that afternoon, i seemed to make my great mistake of getting in the way. (Let me now emphasize the words- "seemed to"). It had to be admitted as my own fault, for lack of immediate-in depth-studies. My conscience was mystified but i felt compelled to accept fault, for this injury. For lack of better explanations, (as none were evident at that time). During the ensuing trauma and confusion, i held to my available conscience. I held to "my fault" until further facts could be discovered. I also had to accept that my memory had blacked out, for a period of time. In fact i concluded that: It had blacked out before i was hit! I blacked out before i was injured! This was a contention which i struggled with internally, (contemplating it for years afterwards). I felt ready this year, in 2013, to clarify my assertions, on this webpage. Despite that some people say that traumas ruin memory permanently. I differ, based on continued, clear and thoughtful analysis. Here are additional pictures, of the physical evidence. <Close up photo of cave-in extent. Before the traumatic occurrence & some hours after the excavator was restored to good use. The above, low-res pictures were added in August 2013. More evidence follows. Ten minutes before the extraordinary blacking-out-of-my-mind, my friend and i had discussed my departure from the area. As i had intended to leave directly. However, as i was passing by the the bank of earth, on my way out, i had decided to take a quick look at the ditch behind the dirt bank. So i was barely starting to climb the dirt bank, when my senses were blanked out. I have consistently recalled the blanking out moment, as such. At the time of my last memory i was still at the bottom of the steep embankment. The excavator arm hid the view of my friend, to his right side and he also thought i had gone away. I would never step into the path of the excavator swing. I'm not inattentive as the perpetrators wanted it to appear. The accident happened after this point in time. Picture above was around mid-day. Several hours later my 'accident' was to occur. However the following pictures were taken weeks later. Due to my near death incapacitation, i was unable to get back to the site for some time. The following picture was taken to the left of the scenes above. I definitely recall beginning the climb, up the bank of earth. The tall bank is on the left, in the picture above. 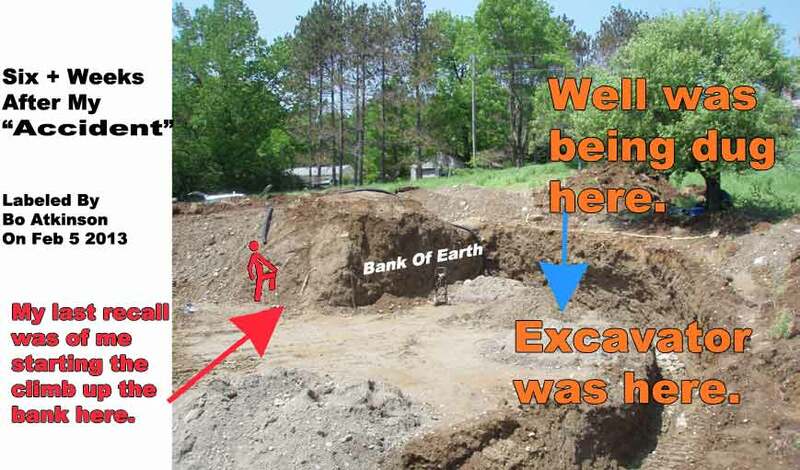 Additional picture below better shows height of earth bank. I was fully aware of the excavator's swing-reach. My intent was to stay safe by checking the position of the excavator bucket, before climbing too far up the bank! Stay safely below the top edge of the earth bank-- At that point i was to see if it was swinging my way. A large excavator takes time to swing around-- More time than i was intending to stay in the swing zone... What happened next was an extraordinary mystery to me! My awareness and senses seemed to become blacked out while i was just beginning to climb up the bank of earth. I recall nothing beyond forming the intent to carefully observe the excavator, while i was still positioned at the bottom of the bank. All of which convinces me that my awareness was willfully targeted and blanked out or "blacked out". It is the first time and only time in my memory, where this has occurred. So i am convinced that a very rare form of technology was employed to get rid of me. I found some similarities while researching these terms: psychotronic-weapons, psychic-blocking, mind-control , blacking out, weapons testing on US citizens-- Done by manipulative perpetrators, who have hidden and crazed agendas... My body was somehow externally- controlled to expose me to a fatal accident. I did not wake up, (recover consciousness after the skull fracturing concussion), until some hours later, as described further below.. Some six weeks after the incident, in September of 2007, i wanted to focus on getting new , paying work, since funding was stopped on this job. The accident had made me look unreliable. Despite that, today (August 2013), at age 64, i am very fit and energetically productive with hard labor. My story has seemed very crazy but i invite the reader to consider my testimony and make their own conclusions. Every human may well become jeopardized as badly as i was in 2007. The publication of individual stories is worthwhile in my opinion. In order to help in small ways, by raising of awareness, of those with ability to rationalize. With ability to see the on-going-hijacking of the human race. A highjacking with an intent to enslave the human race and prevent higher awarenesses from developing. An enslavement to which will include an intended genocide. A use of electronic weaponry will support this attack on humanity, to single out aware people, in the early phases of the genocide, (which includes multiple vectors of hijacking and attacking all rational people). The enslavement objective, would likely aim to keep the the most subservient types of people alive. Dear reader, please wake up to the vast manipulation of our human race today! Be aware of a large body of (publicly available) research given various names. For example, search: "TI" + "Targeted Individual"+"DEW". There are many aspects to this which have been meticulously engineered to be unnoticed within popular human culture. That is largely why the controlled media constantly promotes stressful content interlaced seasonally with "bread & circuses". Media is used to promote deceptive issues and hide the slow genocide. Weapons of mass-distraction and suppression-of- truly-beneficial-technology keeps the public unaware. I was skeptical about all these matters, until after researching many fields of history and technology, as well as my own nearly fatal suppression, described above. I am still just a bit reluctant to believe that i presented a threat, in any way! Rather, let us see that psychopaths operate outside of empathy, outside of rational fair-play. Randomized target practice, by perpetrators, can be expected, huh? Why?! World events today are highly accelerated. Besides competitive building concepts, i have for decades studied alternative and suppressed concepts, sometimes called "free energy". Should i become a targeted individual, for these pursuits? Really? I wonder. I might additionally have been targeted and 'listed' because "i knew too much". The list of imaginable motives goes on. Why can't the perpetrators simply act lawfully and directly? My research has continued and has taken me some years. Below is a free book found on the internet. This book asserts that thousands of citizens are attacked each year. I think the technical, (electro-magnetic-radiation) aspects make sense in general, based upon my non-traditional study of electronics since the 1970s. Perpetrators research and develop weapons against humanity. I have not traced individual entities who perpetrate these crimes. I expect there are many more than one entity. According to multiple internet accounts, the perpetrators just use civilians for various sorts of weapon-ized tests. If random citizens are used in large numbers, in this case, warlike nations will not assume "a major international war action has started". How convenient, just secretly attack individual citizens, with top secret weapons. Is this OK with you? I welcome technical references which support or refute the contents of this page or it's linked references. My own interest has primarily been to compare the claims with basic electronics tech which i studied in 1975. Especially to compare my personal suppression experiences with remembered electronics tech. I would love to experiment with this tech for peaceful purposes, but i always have lacked the connections who possess the means or the opportunities required. Sadly, it would no longer surprise me that malevolent end users, get the research grants in this field. It is widely reported that the weapon research is carried out by unwitting technical professions who are highly compartmentalized. Meaning that most professionals within the development programs have no knowledge that the applications of their products are tested upon innocent, life-affirming individuals. Many of the components in these weapon systems are not specifically weapon-ized within themselves. With great respect, i will introduce a heroic whistle-blower, who has helped humanity wake up to the larger picture. While these texts raises many sorts of questions for me, multiple issues are corroborated for me. I believe these books provide a vast array of terms well worth googling, at one's leisure. A new comer to these phenomena will have difficulty at first. The allegations are overwhelming for the uniformed. As an experiencer, i find it all makes credible sense to me. I am amazed there is so much which is quickly verified through google. I was most interested to corroborate the explanations with my own experiences and my long past study of electronics, (in 1975). Regarding my recovery from the physical trauma, of the murder attempt on my life, I began writing the following, some months after the traumatic attack. Healing is described below. Click here to skip preamble. I went back to work, on the same construction site, about 6 weeks after my "accident". With my excavator friend away at that moment, i decided to rent the yellow excavator in the picture above to continue the project, post haste, by myself. 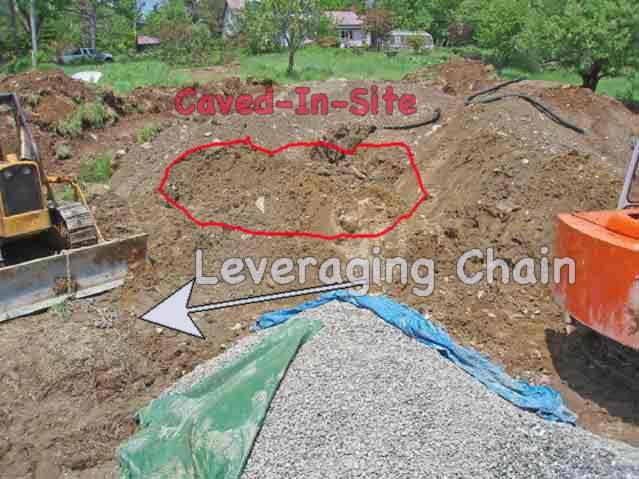 I love creatively-purposed earth moving work like this and originally would have done all this digging except that we wanted to speed the progress up. That proved difficult, for other reasons. The whole event was a loss for all involved. I was deprived the opportunity to build this progressive architectural structure. The site remains as it was in 2007, but it is increasingly eroded and grown over. One takes the risk or looses better potentials. It was a good way to tune up my brain and recover motor skills after such a severe injury. I was hit in the back of my head by the excavator bucket. Further below i explain my recovery efforts by self healing, without modern doctors or their unhelpful protocol. Rather, i healed myself despite the faulty protocol and ludicrous expenses for the CAT scan which was not useful. Except for getting the apparently unnecessary pain killers. Pain killers proved to be unhelpful and a huge waste of money, from savings. In that my body found natural pain suppression and natural healing, subsequently. I also assert, that despite 2009 efforts to update this webpage-- Later reviews of it seemed to reveal it had been tampered with, by slight alterations , (or was it shifting the file with previous backups? However it was little checked, or corrected by me since 2009. I admit to my carelessness in my publication efforts. I will attempt to check it more often, as of my 2012 update. I also updated my writing on the subject of mp3 files and players. My current conclusion is admittedly bizarre, according to average standards. Yet we live on a severely challenged planet, on the brink of human annihilation-- So it seems, that some entities intend to reduce humans populations in general. A preliminary effort to build a house which promised zero energy costs after completion of HVAC. It took me a couple of days after leaving the hospital, to realize that i should not be lying down at all! Powerful skull damage challenges good reasoning. So i determined to sit up continuously and even sleep in a sitting position. I was startled to find my long term head ache completely vanish in about 9-18 hours of sitting upright, even though i had stopped using any sort of pain remedy! Perhaps. a reasonable protocol should advise upright posture for severe head injury**. I had to think of all this on my own, despite constant, severe head pain. This simple advice was absent from hospital protocol. My scholarly brother later verified the protocol fact. How can such poor protocol come from science? After curing my week long headache through my own remedy, it felt truly miraculous. Other severe issues persisted: Severe dizziness, ear popping, imbalance and my vision was still completely skewed since the accident. My eyes were totally out of alignment except from one corner (viewing far to the side only). I wondered if i was literally finished. I wore an eye patch to remedy the "cross-eyed"condition. Searching the www for information about all this seemed to suggest that my condition was incurable according to western-medicine. I stopped driving for 2 months. People with all my symptoms tended not to heal. Surprisingly however, each of my conditions did slowly improved over a period of a month and were almost essentially healed in about 2-3 months. ** Update: While "sitting-up" worked in my case, a casual conversation, much later, defended the protocol, which i personally found harmful. A person identifying himself as a medical doctor explained that there is a possibility of spinal fluid leakage, in some injuries, somehow, in some cases -- That lying down prevents the unwanted leakage... Therefore, victims of head injury should not be asked to sit up. However he did not make clear how this can be readily diagnosed or differentiated from my nature of injury. Nor did he explain how my poor scull was to drain all that "blood on the brain" continuously pumping in between my dear brain lobes. Nor did he elaborate any further. I'd be glad to link suggested references, which pertain to this discussion, email me. I could link appropriate references right here! Frankly, it is my increasing expectation, that that science has literally been hijacked by big pharma and the parent chemical industries. Fascism, is,'t it? **Additional update, 2 years after my accident: I feel totally healed, with just a slight, occasional, popping in one ear, during animated conversation, but not otherwise. I attest this healing was entirely by natural means which largely consisted of vegetarian and vegan foods, generally, along with supplements aimed at kelating out the damaged by products in my dear skull. It has worked and the curative element were low cost. I did not use any pharma protocols, nor could i afford MD assistance. There were extensive injuries reported by the radiologist, which i can prove, with evidence recorded digitally, by qualified, certified radiologists. If i had reasoned better, i would not have visited the emergency room-- One can not think very clearly with head trauma and severe pain. I would not have needed the oxy codon pain killer if i had avoided lying down during the early days, following injury. I would have healed sooner, if i had not gone to the emergency room. Yet with proof in hand, i hope my experience will serve others. I pray that the idiots who are trying to ruin human health, world wide, with devices like Codex Alimentarius, will fail in their attempt to prevent individuals like me from purchasing health supplements, without difficulties! To summarize quickly, my CT Angio scan results revealed a skull fracture, blood on the brain but fortunately no aneurysms. It seems logical that "blood on the brain" would cause severe head-ache pain, due to normal blood pressure. (When the head is gravitationally level with the heart, that is. Sitting up reduces the blood pressure on the all-important blood brain barrier.) However, it is illogical that a modern science would hide the most appropriate remedy from head-trauma victims, (in favor of monopolistic remedies-- Masking the pain instead of relieving the high pressure on the blood-brain-barrier). I largely attribute my healing to intensive nutrition along with self styled mental and spiritual discipline. I have always respected high-quality dietary protocols and "dietary supplements". Especially when i don't have time to shop around for better ranking food, nor time for proper preparation. I generally admit that food preparation should be prioritized. I was especially appreciative to find specific diet and supplement protocols put together by Gary Null. Gary's tablet formulation called "Supreme Health Formula" contains many super nutrients, which,are very helpful to brain health and brain recovery. To my understanding, Gary generally uses and favors organic plant based sources instead of chemically-synthesized or animal-tissue-materials. It is a little like getting super nutrients when you can't spend time shopping around. If all common foods had all the nutrients or enough of them, supplements would not interest me. I'm very glad that i had been using Gary's formulation prior to the injury. I believe my stamina was helpfully strengthened by use of scientifically proven supplements. By contrast, modern medicine has for too long focused on disease-cosmetics, instead of health boosting nutrition. Modern medicine has for too long preferred to mask the symptoms with drugs and neglect unhealthy side effects. Worse yet is the absence of repair which good nutrition offers. The body better achieves repair with nutrition. Pain-masks cost more than does carefully chosen nutrition. I splurged my money and bought many selective nutrients (as compiled by Gary), which i feel played a vital roll in my head- recovery. In fact, Gary has compiled a specific, detailed protocol for nutrition of the brain, which felt like a godsend for my head injury. I trust Gary because for decades, he has followed many scientific research journals and has himself done mainstream nutritional research as a qualified scientist. Moreover, Gary seems to put his profits back into his publicly spirited mission. He even, reportedly provides certified nutritionists to provide free services in NYC. Amazing. I have no reluctance to support a business like that. We should pay much more attention to restorative nutrition and resist monopolistic blinders. Unfortunately, the pharmaceutical industry repeatedly tries to outlaw marketed supplements through greedy political tactics. I feel sorry for all those who suffer needlessly from medical iatrogenics. I believe the CT Angio scans were not worth the cash in my case. No restorative benefit was received from them. Only arrays of X-ray radiation-exposures were received. So... In less than one day after entering the hospital, i left, (My wife driving). I instead found relief at no cost and could begin restoring my health with free market nutrition. I avoided further involvement with medical services, as i did achieve weekly health gains naturally, on my own. I gradually began "working again", at home within days of clearing the head ache (and before regaining full vision or full ambulatory balance). Slowly but surely, my eyes, my strength and balance-sense improved. Progress seemed very slow, but it was steady and far better than hospitals have reported for severe head trauma. From what i understand, modern pharma has achieved little success with permanent head-trauma cures. I'm so thankful to say i have been well for months, thank God. I attribute my natural healing to what a secularist could call spiritually-based-will-power, better informed nutrition and self discipline (get back on the horse sense). I have tried to stay informed on health subjects from a variety of sources, throughout my life. Earned knowledge has empowered me while medical-insurance would have weakened my spirit, by depriving me of this self-empowering experience, (of natural self healing). Health insurance includes an invisible mental commitment to yield up some measure of self reliance. Insurance can diminish self-reliance of an individual. Self reliance can promote health. Yet for dealing with sudden injury, decisions must be made quickly, without time for study or contemplation. Still i see little or no advantage to a hospital protocol that actually postures severely injured heads downward, (where blood pressure increases on the brain, due simply to physical gravity). Why should hospital protocol ignore the importance of gravitational effects on the blood-brain barrier (after severe injury)? How can hospital-protocols remain so drastically quite about this, i ask you? Head trauma? Sit up and stay sitting up, sleep upright! Don't always assume that the sufferer of head trauma should lie flat! Provide immediate analysis of CT Angio Scans to determine the type of leakage. I found that my head ache could reach full force within a few hours of lying down and that it subsided after more than a few hours of remaining upright. After a day and night of remaining in an upright posture, the head ache completely vanished, permanently. I avoided lying down for maybe 2 months! Finally all the blood-pressure-leaks into my skull could heal! Many natural foods clean the body internally, remove waste material and remove toxic accumulations. Organically grown nutrients are intentionally freed from pesticides and are very effective cleansing agents. By contrast, overly commercialized food grown on depleted farm soils will lack important nutrients and instead dump toxic pesticides into our body. I believe this is especially relevant for clean up and repair of severe injury including severe head trauma. This nutritional approach to health has long been suppressed for fear of weakening vast pharmacological monopolies. Presently there is an attempt to take over the word "organic"and dumb down legal definitions of that word. Consumers are slowly coming to appreciate the organic food advantages. Sadly, the big players treat it as a branding war instead of scientifically proven product options. Powerful entities fear loosing market share. Their market share has for decades been dependent on uninformed consumers. Furthermore, authentically spiritual approaches to health are discouraged by the extreme materialism. However, instances of healing have been found through authenticity spiritual approaches. A spiritual attitude helps guide a healthy mind in sorting out material paradoxes. Much of life is perplexing. Why should things that taste good prove bad for us? Why should things that taste bad prove good for us? What works for the greater good or greater depravity? Generic spiritual attitude helps to resolve exhausting paradoxes. Now let me get back to the materialistic side, (where modernity defines and confines health). There are a large number of helpful nutrients to consider, so i advise life-long study. For a start, removal of nutrients as in "refined white flour" or in processed food deprives us badly. Whole grains provide critical nutrients. Food processing largely deprives us of nutrients and instead, harmful substances are installed, (such as pesticides and assorted food cosmetics). The pesticides and cosmetics simply overload the natural mechanisms of toxin removal. There are many sources of natural-health information, pro and con (this issue or that issue). Unfortunately, the majority choose to remain conned through mainstream indifference. Indifference to achieving a high standard of health. The fact is that some people have found nutritional and other non orthodox health solutions. This has progressively occurred through countless generations. Strict dietary protocol has healed a variety of common ailments. Orthodox medicine has broadly ridiculed self empowered natural healing. Some limited, initial acceptance of dietary protocols started gaining mainstream popularity from about the 1970s, continuing to the present. I have followed much of this for nearly 4 decades now, while medical- orthodoxy dragged it's feet in the nutritional approach. Dietary approaches to health were often discourage by cultural leaders. A populist notion has been spread widely which foments distrust of scientific dietary information, because it is difficult to follow scientific progress, (which is continuously updating). As one example, scientific research into cholesterol and fat consumption has significantly changed and even reversed in some aspects. Reversed because big pharma had earlier wanted to sell it's ill conceived "pills and potions". People dislike spending time to study the numerous details and the struggling history of dietary science. The populist question arises, how can you trust a science that burdens you with changing and with confusing facts? Progressive, developing facts should not upset us. If we accept where higher truths may leads us. If we stopped being a figment of monopolistic imagination. Dietary facts would be more reliable if the studies themselves were not monopolistically manipulated. Honest scientific comparison of orthodox medicine with specific dietary protocols would reveal some superior performances of dietary science over monopolistic orthodoxy. That is why such comparisons through double blind studies are prevented by authoritarians. Orthodoxy refuses to test superior methods, fearing a loss of market share. A lame excuse is offered to the effect that comprehensive comparisons would cost too much. Rather it would clearly demonstrate that dietary protocols would win over orthodox pharmaceuticals. (If scientific comparisons were made. Instead science isn't funded where monopolistic profits would suffer. Typical market forces resist science.) Furthermore, orthodox medical cheerleaders, claim that they have increased the human life span as compared with historical records. I have long questioned this notion saying that technologies, such as the poly-phase electrical power distribution and rural electrification are more responsible for increased life spans. The poly phase system, (three phase power and long distance power distribution) invented by Nikola Tesla and first implemented by Westinghouse Corporation, made possible widespread refrigeration of perishable necessities like food. Improved water supplies and sewage treatment arrested ravaging disease. Improved transportation increased food supplies, while better preserving food at the same time. (Electrical refrigeration also began wide distribution, around that time). Social consciousness teamed with enlightened business, gave the masses education. These items and others increased the average life span of our times. Medical orthodoxy does not deserve all the credit which is heaps upon itself, concerning health statistics. How dare they claim all the credit? Easily answered: raw profiteering with political pay-back. My preferred format for lengthy information has always been the spoken word in place of text (which requires my reading of lengthy texts). Gary Null offers extensive dietary information through audio broadcasts and podcasts. (Gary is also a prodigious writer for those who prefer reading.) I subscribe to many free audio sources, thanks to Apple for jump-starting this progressive media market! Podcasts let my mind absorb information while i do my humble hand work. Even major universities are also now pod casting valuable educational material, for free! I love this wide ranging free cultural service. To be fair, there are many other sources of good information on natural healing associated with nutrition. I will point to a few i have noted lately. I am cautious with orthodox medical sources of information, because for decades, these dominant sources have hidden issues like iatrogenics and seem to have opposed nutritional awareness. At the same time pharmaceutical lobbyists try to outlaw supplemental nutrition through legislative suppression like Codex Alimentarius. One should be free to find a source which fits their personal choice. Many of my educated friends believe that nutrition should be addressed only through plain food. This might seem great if you are appropriately situated, but not practical for overtime workers. I think a good source on this sort of "food-only" approach can be found through many sources. Dr Mercola offers exhaustive information with a chat group over the internet. "The Warrior Diet" seems to include some unusual dietary ideas which i like, especially the night-time big-meal preference. I theorize that hard struggling cultures often had no opportunity during the daytime to prepare food. By nightfall, they could make a fire, relax and eat the big meal. This basic pattern also gripped my lifestyle, of focusing on work accomplishment during the daytime. Then by nighttime, i could wash up, relax and make a good meal. I happened to "convert" myself to a largely vegetarian diet in 1985. It lent me hope that planet earth is sustainable and also that this practice might better tune my brain functioning, (by several means). That my giving up meat unburdens the world from my small corner. It is not evident that the world can support 6 billion meat eaters! I responded to the problem by self-demonstrating health and sustainability on a nearly vegetarian diet. (My wife won my support to raise a little poultry for eggs and we very occasionally ate fish.). After many years, of being perhaps 90+% vegetarian, i am healthier now than when i was as a full omnivore. Recently i am trying to go fully vegan in diet. I have devoted my life to increasingly live in a sustainable manner that does not unduly burden the world. Full vegan commitment has been hard for me to begin, but scientific research on what is possible with plant-based sources greatly moves me. I feel that full vegan protocol has restored health without need for over-priced, authoritarian, medical intervention. If food market prices tend towards an accelerated price increase, then we may all do well to find a sustainable diet, (an affordable and fully nutritional diet, not a silly fad). It is said that meat requires 200 times the amount of water, to raise it. Two hundred times more water than potatoes require for production. So much meat is raised in draught prone lands, as deep aquifers underground are drained for meat production. Are we approaching another dust bowl? Dust bowl history is well worth a read. The Amazon rain forest is being devastated in order to support animal feeds for pork, beef, etc... Meats are promoted to human food markets as sort of a vital staple, if not the most essential food item. My experience of 24 years, tells me this is mistaken, if not a drastic cause of climate change, (because rain forests provide the world with vital oxygen). It can be difficult to find or afford wholesome food. It is labor-intensive to grow considerable amounts of wholesome foods in one's own garden. In that this would typically be a second job in addition to an occupation. Difficult also in the sense of fully devoting one's life style to developing labor habits and proper storage. Habits must be developed for weeding and tending vegetables, etc.. (Here was my visualization for a satisfying garden system). Vigilance over all, that is chosen, can be very disappointing as wholesome supplies do cost more than inferior supplies. (Monopolies will not encourage better products and thereby monopolies cultivate inferiority). The urge to go out and work in a service economy instead, can distract attention from wholesome lifestyle alternatives. With better income, one can simply buy the more expensive but more wholesome foods. One can still gain some sense of satisfaction by supporting "local sustainable producers". I've savored many options between these various contrasting approaches. It is easy enough for me to grow health inducing vegetables for 5 months a year, but the remaining 7 months demands more breakthroughs (in a cool climate). Raising sprouts will easily provide some important "cleanser nutrients" while saving money. Greenhouse gardening certainly can extend growing seasons, but is also fraught with pest issues and "climate control issues". Foregoing meat in my diet saves me considerable money. Setting up good "culturing" processes like making tempeh and sour kraut still illude my efforts, but become priorities, as unemployment appears to increase, these years. While purchasing foods is easier and while income can cover it, let me recommend super-star favorite substitutes. Two products made popular by Gary Null are of special interest. So called "Red Stuff" is an assortment of super nutritious berry residues. "Green Stuff", likewise is dried green, plant based nutrients. These two organic products provide proven "DNA-repair" and "internal-cleaning", for over-time workers, (the work style which i tend to follow). Easy to use in shakes or smoothies or even as seasonings. I haven't tested firsthand, other brands similar to Gary's products. Yet the concept seems vital to me and actually restores alertness and energy levels. In the old days, the 1970's, when i browsed through nutrition books, similar "wholesome food" claims were evident, but organic products were not so easily available or affordable. Today, getting a comprehensive product "instantly", sure makes the test easy. I still liked a rare coffee until recently, but it is a harsher jolt of "energy" in many ways (largely due to acidic and diuretic effects). The subtler energy boost of Green Stuff or of green vegetables, lasts longer, despite the absence of a super jolt. I always used to space-out consumption of coffee in relation to nutrition, because coffee tends to leach out neighboring nutrients in the digestive tract, (as coffee is a known diuretic). The addictive nature of coffee is hard to control, except, perhaps, where very little is used. Yet the burden of pesticides in most coffee products should give us incentive to severely limit it's use to the point of indifference to it's attractive memory. The point of non-addiction occurs when we sustain higher convictions of nutrition-science. Conviction seems to rely upon the relationships which we maintain and the media we absorb. Choose wisely or we loose ground. Yes, i may seem a bit compromised by exposing my lost job and medical experience. Instead i feel stronger since i learned how to actually heal my head injury without over-priced methods. Natural self healing is real power. Consider the power of honest self evaluation and compare all available protocols. Consider this page a protest against larger system problems, that politicians can't fix. They simply can't fix personal-choice problems, nor overcome lobbyist manipulations. Sadly, politicians refuse to favor science over unreasonable monopolies. (Monopolies which finance political careers and political power). Separating monopolistic giants and State should be key. (Just as it was key to separate Church and State). December 2008 Summary: The smaller remaining ear-popping symptom has subsided very gradually throughout the year. I have had no other issues throughout 2008, except for one short period in June 2008. I was proceeding with my most stressful job for the summer, when the slightly dizzy spells seemed to almost return. It occurred only when moving my head around vigorously and quickly passed. This effect seemed to last perhaps a couple of weeks and then completely vanished again. I have read of symptom reoccurrences on the web somewhere, but mine was very mild and i proceeded in my work including the climbing of ladders and scaffolding, overtime, without incidents. So it should be fair to say that my healing was complete. I've economized on my supplements. My outdoor vegetable garden was prolific until mid December with kale, (the easy to grow cold crop. I ate tons of it instead of Greenstuff and still work on some Kale and grapes which i froze. My objective is to use lots of dark greens for health maintenance, along with our perennial berries here, raspberry and dark grapes. I have intentions to pioneer some particular green house ideas. A means to grow water cress also appeals to me, if these greenhouse ideas would work out. Frankly, i expect that the 2008 economic crises will grow in severity and that food costs will rise, as draughts affects production. A consequence of system collapses may ultimately result from incompetent monopolies, as indicators have already appeared immanent in 2009. I am moving onwards towards full vegan diet gradually, even if the transition happens slowly. Well, two years passing and i manage to feel better and better, (despite the serious head injury described above). None of the original injury-symptoms remain, except the occasional ear popping, but my hearing is still above average. My personal heart-felt-thanks, to my use of more supplements, wholesome foods, self education through podcasts, while i work productively. Construction labors and gardening are my form of combining exercise, which integrate with "making a living". I could live happily without significant income , but have accepted good pay when it comes my way -- Income has allowed me to explore my potentials with computer software. Again, i have worked for a living and have primarily focussed on self-sufficient methods of living. (This by the way, has widely been dismissed by people i have known. I think it was easy to disrespect self-sufficiency during the economic-bubble years with the likes of Reagan, Clinton and Bush, who all pushed risky credit, along with tilted trade policies. Having kept a "self-sufficient" edge throughout my life, for decades now, i can say it was affordable and most rational for me as a "creative". It was not always respected in the "bubble economy years". However we did sustain and used times of unemployment wisely, in the pursuit of our creative spheres. My wife's main interests were floral and plant related. My interests, are to be seen all over my website. Low employment periods provided plenty of time for artistic endeavors, which typically pay little or nothing, but can fulfill one's inner ambitions, (no matter if one's ambition is humble or over-the-top). Originally i came to my land, almost as a serf and my wife and i pieced together what we now own, building it over 4 decades. "Self sufficient habits" provide stability throughout any sort of economic cycle. 2009- Find more top-notch podcasts, (for the multi-tasker). I found more superb podcasts of great interest. The easiest source by far is Progressive Radio, due to the growing menu of new hosts, covering many vital subjects of today. One can download passed shows in the archive, which remain timely, due to the tremendous foresight and insight of these people. One can subscribe to receive periodic, new shows. New hosts are added to the network and the system improves continuously. Besides this formidable network, another favorite health information website has thoroughly captured my interest. "Natural News" which i believe was founded by The health Ranger (Mike Adams). Once again, excellent podcasts on health related issues can be downloaded! This speaker Mike Adams has such a cheerful voice and a positive attitude to promote his deep understanding of various sciences and his constructive perception of our world and of our times. He also interviews many individuals who are marketing "super foods" and super supplements. Usually these are highly accomplished and highly disciplined individuals, from many walks of life, not just one-track vendors. I get the sense of hearing many perspectives, yet these all generally support the notion of new-found health discoveries. Discoveries which were somehow missed throughout history. Missed by the average person that is. Actually, many of the super-foods have been known by isolated individuals or groups (even sometimes over the centuries), who were shunned by profiteering market places. Well, OK, it has simply taken time for evolution combined with free-will to make these subjects more available and better known. We still have a hang-over from feudal- authoritarianism, in our world which requires patience, on the part of intelligent people. Mike seems to be the producer, interviewer and narrator of these podcasts. Mike also relates to the digital age, which might help engage younger people, in the search of healthful life strategies. To be fair and balanced, i expect the proponents of the status-quo do deserve some consideration. My personal approach is personal and not intended to sell anything, besides my story, which is offered free and not funded by any sponsor. So, i sought and found a well financed, allopathic (big pharma) website. The articles and comments which i read, seemed very dismissive of natural heath remedies, which by the rankism there evident, seemed to disapprove self-cures like mine. Certainly, some of my favorite sources for science in health issues, seemed to be cast in a bad light: Dr Mercolla, Dr Gary Null PHD, and Michael Adams, The Health Ranger were cast in a bad light. Pro pharma shills seemed intent upon banning real health. In years before and increasingly since my "accident", laws are forced into being. Which destroy human well being. As fascists who are currently in power destroy our planet. Science should not be controlled by sponsors with fascist agendas. Simple minds cannot perceive the gradual attempt to crush open scientific investigation and dialog. Our human race is doomed to suffer it's fate of ignoring it's destruction, by fascists-in-power today. I absolutely love informational and educational audio resources. I love to study deep subject while involved with other productivity. (For example physical labor, which also provides healthy invigorating exercise). Since the time of my "accident", the available spectrum of these resources has expanded extensively. Besides recorded materials of podcasts, i bought a text-to-audio conversion-software . All normal text can now be inserted (pasted) into this software, which is then transcribed into voice. The good-hearted people of the internet increasingly share their works in html or in pdf formats. These sorts of text easily transfer into podcasts. I like recycling, reusing, salvaging and saving money. The mp3 player devices on the market offer a variety of styles and functionality. The cheapest variety can be used with headphones or be attached to amplifiers an older audio devices. Ten-year-old stereos are more durable than the economy type sold today, (which i find break easily and also are more difficult to use). Yard-sales have cheap stereos for the frugal. I cannot say enough in praise of informational and constructive broadcasts available on-line! Be aware that copyrights might apply to some materials in this regard. For larger bodies of text i ask permission which has always been extended for personal use of my text choices. I also learning from thought provoking material, now widely available on the internet. My decentralized life style in Maine. My consulting and contracting services page. See my 2007 'accident' page. Support This page by googling key words on it. Then click the link to this page! Also google my name to raise my alexa.com rating.